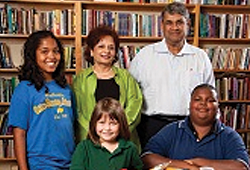 For Dilip and Vibha Patel, giving back to their community is a priority. Through a variety of planned gifts, including two charitable gift annuities (CGAs) with the Oklahoma City Community Foundation, they can ensure their charitable giving will continue in perpetuity. As children growing up in India, the Patels witnessed their parents helping those less fortunate and treating others in a manner they'd liked to be treated. Now citizens of the United States, they are applying their parents' philosophy through giving opportunities at the Oklahoma City Community Foundation. "To help young people get good education so they can improve their lives and help others in the future," he explains. "And, we want to help people in our community or anywhere who are less fortunate than us due to various circumstances." In addition to an advised fund through which they recommend grants to an number of nonprofits, the couple wanted to ensure their charitable giving would continue well into the future. Mr. and Mrs. Patel established two CGAs that will yield payments to the couple for life and then the remaining assets will support various scholarship programs for students who may not otherwise be able to further their education. Through their thoughtful planning, the Patels' have created a lasting legacy for the young people in their community. The Oklahoma City Community Foundation offers six charitable gift annuity options. To discuss further, please contact Joe Carter at 405/606-2914.